The author cooking on the MSR Pocket Rocket 2 on the Pacific Northwest Trail, a 1,200 mile backpacking trip from Montana to the Pacific Ocean. Photo by Naomi Hudetz. We spent almost two years researching and testing backpacking stoves. First, we analyzed hundreds of professional and customer reviews to develop criteria to judge stoves. From there, we identified 18 solid backpacking stoves and spent 1,500 miles of backpacking to test 11 stoves in five different states. Based on those findings, here’s how to pick the best backpacking stove for you and how to choose the stove that’s best for your hiking style and goals. Once you’ve figured out how to choose the stove for you, read our full comparative review of backpacking stoves to learn more about how the models performed side-by-side. If you’re looking for tips on other backpacking gear, check out our: Best Backpacking Backpack guide, our Best Backpacking Tents guide, or our Best Backpacking Sleeping Pads story. What is a canister stove? What is an integrated stove? Which one should I get? How do I pick a pot that works with my stove? What is a regulator and do I need one for my backpacking stove? Consider a few questions about your backpacking style and where you’re going before purchasing a backpacking stove. Here, Off Trail On Track guide Duncan Cheung teaches students the finer points of how to light a stove. Photo courtesy Duncan Cheung. The most important thing to consider when choosing a backpacking stove is whether it will work for your camping and eating style. Is it legal to carry a canister stove or integrated stove where you’re going? Are you cooking for a large group? Will a canister stove or butane fuel stove work with the temperatures and altitude of your hike? How important is it to you to be able to simmer or cook your food vs. just boil water? And of course, the logistical question--will camping pots and pans you already have fit onto this stove? These questions and principles will guide you through the next question: upright canister stove or integrated canister stove. Not sure what the difference is? Read on. As you’re choosing, remember these goals and how you answered your “hiking style” questions. These will help inform your decision. If you’re looking for other ideas on how to choose a stove, we recommend reading the How to Choose section from Adventures in Stoving. These are all integrated stoves. They all come with their own pots. Photo by Liz Thomas. For this story, we reviewed upright canister stoves and integrated stove systems. Both of these types of stoves are aimed at backpackers who want to make simple meals for one, two, or three people. Most of the stoves we considered are best for the solo or couple backpackers, although we do include a group pick. All of the stoves we considered use propane/butane/isobutane gas canisters available at most outdoor and sporting goods stores. The author testing canister stoves in northern Idaho. Photo courtesy Liz Thomas. Upright canister stoves (aka canister stoves) include our two winners, the MSR Pocket Rocket 2 and Soto Windmaster, and contenders like the Optimus Crux, SnowPeak Giga, and SnowPeak LiteMax. They are a good choice for most backpackers because they are simple, lightweight, compact, easy to use, and affordable. A canister stove screws directly onto a canister. The canister keeps the stove upright and stable. They are ultralight backpacking stoves that are simple enough for everyone to use. Upright canister stoves also have on/off switches, meaning that they can still be used in areas that ban alcohol stoves or campfires (which has become a near annual ban in the American West). We also like that canister stoves are quick to light and the flame adjusts easily. In general, canister stoves are a better option for folks who want to simmer or control their heat. However, unlike integrated stoves, you will have to purchase your cookpot separately. This means that you’ll have to make two gear decisions: stove AND pot. Not all pots work all stoves, so a canister stove comes with a little more research. For more info, see our cookpot buying suggestions. Two integrated stoves set up as French presses to make coffee. Photo by Liz Thomas. Integrated stoves like the Jetboil Flash, Jetboil MiniMo, and MSR WIndburners also use a fuel canister but work like an all-in-one system. Integrated stoves include your pot and lighter (fuel sold separately). The main difference is that on integrated stoves, the pot screws into the entire stove system. This can lead to very quick boil times and sometimes reduces wind resistance. However, integrated stoves were designed to boil water quickly and are only so-so at cooking that requires lower heat. Indeed, this is what Jetboil has been known for. We think the huge benefit of an integrated stove is that it comes with a pot. This means you don’t have to make the decision of what pot to buy. While Jetboil-style systems appear to be more expensive than a canister stove, when you factor in that it includes the price of the pot, the prices are fairly similar. We chose stoves that could handle trips to epic places, like Cathedral Pass on the Boundary Trail in eastern Washington. Notice the stove next to Treeline Review co-founder Naomi Hudetz. Photo by (at the time) a very cold Liz Thomas. We judged the hiking camp stoves based on the criteria we determined were the most important to users. These criteria were informed by customer and professional reviews and our own experience guiding and teaching backpackers about how to use gear. Like any piece of gear, a stove is a tool to serve you. It’s there to make your trip easier, more enjoyable, and more fun. The best stove is the stove that will serve you and your needs. We list the criteria ranking in order of importance to us. You may find some of the criteria towards the bottom of the list more important than stuff at the top. Keep this in mind while you’re looking through our winning stoves. The MSR Windburner is one of the most intuitive stoves to use. Photo by Liz Thomas. We think a backpacking stove should be intuitive to set up and put away without a steep learning curve. In our opinion, ease of use is the most important factor when choosing a hiking camp stove. In fact, we wrote an entire section on why. Having a backpacking stove that is stable is not only important for your safety (avoiding skin burns should that stove topple) but also to protect the places where we camp. Ultralight camp stoves that can be easily knocked down are more likely to cause a wildfire--even if they have an on/off switch. Tippy stoves can also hurt you. We’ve seen backpacking cooking stoves topple over, spilling water on legs and causing second degree burns. We’ve seen stoves spill their boiling water into the desert sand at times when a backpacker couldn’t afford to lose a drop of water. Spilled hot dinner water is the least efficient use of fuel. For every cup of almost boiling water that is lost, you’ll need additional fuel to boil another cup. This means your ultralight camp stove is half as efficient as a less-tippy system. This means you’ll have to carry more fuel (weight) to make up for your unstable system. Extra height can make a stove more prone to tipping unless it has a robust three-legged support system, as seen here. Photo courtesy Liz Thomas. Stability is a function of your pot, your stove’s design, and the ground that your camp stove is on. Assuming that your stove is on totally flat ground, like a picnic table, your stove can still have stability issues. For example, if your pot is too tall or too wide for your small backpacking stove, it won’t be as stable. A backpacking cooking stove’s design can impact stability as well. As mentioned above, a too tall stove can make a stove more tippy. (Height here is measuring from the base where it screws into the canister to the tallest height of the pot support). The size, angle of, and/or number of pot supports (aka, arms) impact how well your pot will stay in place. Some backpacking stoves come with three pot supports (like the MSR Pocket Rocket 2) while some come with four arms (like the Soto Windmaster). We especially like hiking camp stoves that have grippy “teeth” on their pot stands to create friction between the stove’s arm and the pot. We mention in the full comparative backpacking stove story when we found stability issues. You want a stove that is going to survive the conditions where you take it. Photo courtesy Duncan Cheung. Will the backpacking stove continue to work even if it isn’t cared for like a baby? Or will parts bend or become crooked when used by those who are tough on their gear? Does it have moving parts that can get lost? Does it have parts that can snag or break off? Will dust, dirt, or sand easily clog the system? When a camping stove is slow or won’t function in cold weather conditions or at altitude, it’s the kind of bummer experience that makes you hate your stove. While we sincerely hope you don’t find yourself having to cook in wind or bad conditions, we note how backpacking stoves perform in harsh conditions. Our goal, after all, is to have you love your stove almost all of the time. For those who are quite concerned about wind performance, we recommend the Soto Windmaster canister stove or the MSR Windburner. Most backpackers want hot water and dinner pronto after a day of exertion. Backpacking cooking stoves can generally boil 1 cup of water in four to six minutes, but some stoves are faster than others. Aside from in wind or altitude, I’ve only seen backpackers complain about the speed of their hiking camp stove when they are very cold or hungry or when their hiking partners get to eat their food slightly faster. Some stoves are better designed to work in wind, cold, or altitude (see below), factors that can significantly slow or hinder boiling time. There will come a time when (like it or not) you’re camping or backpacking and it’s cold outside. Get a stove that’ll work well in cold conditions and you’ll have a smile this big. Photo courtesy Duncan Cheung. New technology is making it easier for some backpacking stoves to work in 20-40 degree temperatures (likely the coldest conditions most three-season backpackers will face). Because cold gas has less pressure and canister stoves need pressurized gas to function, there’s a myth that canister stoves don’t work in the cold. When camping with others, be mindful about how much noise your stove may make and whether it may impede on your ability to socialize. Photo courtesy Duncan Cheung. Some backpacking stoves sound like a rocket jet taking off. This can disrupt conversation and/or may detract from your wilderness experience (and maybe bother the wildlife, too). We’ve found sensitivity and tolerance to stove noise differs from person to person. We note when users found models loud but didn’t disqualify a stove just based on noise (although we know folks who would!). The Jetboil MiniMo pot fits a fuel canister and the burner (underneath the canister in this photo). You can still fit the lid on top. This makes it easy to put away your cooking set-up in the dark or by headlamp, as was done with this photo. Photo by Liz Thomas. While most stoves we considered are similar in size/height, the most important question to ask is whether it will fit into your cook pot (or will it fit in your pot along with your fuel canister)? The answer depends on your pot and usually the height of the backpacking stove. Most of the stoves we considered will fit pots 750 mL and up. Integrated stoves like the Jetboil or the MSR Windmaster we recommend will often come in last on the compactness/bulkiness test. Integrated stoves use the pot as part of the system. Unfortunately, most of those pots are beer mug-shaped instead of squatter pots available for traditional canister stove systems. We prefer integrated stoves where the cooking accoutrements and the canister can fit inside the pot (see photo of Jetboil MiniMo above). If the pot is going to take up that much real estate inside your backpack, you should at least be able to keep all your cook stuff in one place. We also have a strong preference for stoves that are small enough to fit into the front mesh pocket of a backpack. This means that you won’t have to dig through your pack to have hot drinks or hot lunch on the go. It also makes it easy to make yourself a hot drink as soon as you get into camp. In cool spring or fall weather, warm beverages can be morale boosters and motivators. By keeping your ultralight camp stove in the outside mesh of your pack, you are less likely to snag or catch on your other gear. Unlike your other gear, stoves can get wet (or at least the pots can). That makes it a prime candidate for outside pockets that aren’t waterproof. This also decreases the chances that food odor or residue from your pot will leak onto other gear in your pack, like your sleeping bag. The robust flame on the SnowPeak Litemax at a camp near Mt. Baker, Washington. Photo by Liz Thomas. Cooking up potatoes and sweet potatoes at a lunch break on the Pacific Northwest Trail in Montana. Photo by Liz Thomas. Are you simmering food in your stove? Are you baking cornbread? Or are you just boiling water? If you are simmering or baking, you’ll want to control your flame. In general, backpackers prefer to have some ability to cook more complicated backcountry meals. But while thru-hikers may set this goal at the beginning of the trip, more often than not, after a long day of hiking they decide it is easier to just boil water and add that to pre-made dehydrated food. Which backpacking cooking stove you choose will depend on your goals, group size, hiking style, and length of trip. Although weight is a priority when choosing backpacking gear, we found the differences between the models we considered to be within two ounces of one another. Those differences weren’t enough to sway our decision. If you’re concerned about weight, measuring the fuel efficiency of your unit will be a better indicator of total weight carried than the weight of the backpacking stove itself. Or just carry one less candy bar. When it comes to a quality, budget stove, the Haman’s BRS 3000T cannot be beat. But our testers and customer reviews warned of safety concerns, so it ultimately was not one of the picks we recommended. Photo courtesy Scott “Shroomer” Williams. We recommend quality backpacking stoves at a variety of prices. Less expensive stoves aren’t as fast, efficient or reliable as the more expensive ultralight camp stoves we recommend--but they’ll get the job done. How much money you spend on a stove should be based on your financial situation and how frequently you will use your backpacking cooking stove. Gearheads love to debate stove efficiency like a bunch of Prius owners trying to outdo each other in Hyperdrive. But most users will find fuel efficiency between the backpacking stove models that we considered to be comparable. The differences between the hiking camp stoves we considered weren’t large enough to disqualify any of the models. Unless you are going on a trip somewhere it’s impossible to find a store or location to mail a fuel can (like an international expedition), stove efficiency shouldn’t influence your decision. Some backpacking stoves come with their own built-in ignition lighter, called a piezo, that lets you press a button that creates a spark. But in our experience, the piezo fails over time. Backpacking stoves with piezos tend to cost more than stoves without piezos. They also weigh more. We prefer a stove without a piezo because carrying a Mini Bic lighter and using it to light the stove is easy enough. Piezos can only ignite camp stoves, but a lighter can also be used to light stoves, campfires, candles, or smokes. 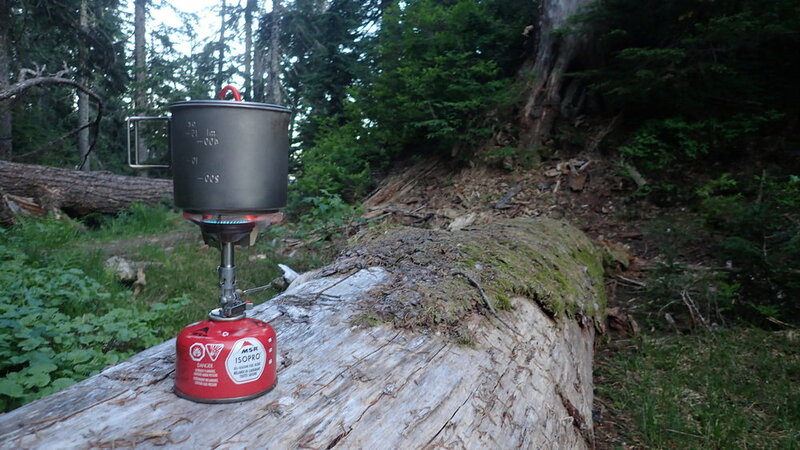 See our tips section for lighting a backpacking stove by Bic Lighter. A favorite feature of the Mariposa is the left side pocket (visible in this photo). It can fit a two-person tent or other items you may want to store on the outside of your pack. Photo by Liz Thomas. In our full review of the seven best backpacking backpacks, these features’ presence and quality often influenced our ultimate decision. Temperature impacts how pressurized the gas in your canister is. Cold temperatures=lower pressure. Warmer temperatures=more pressure. How much pressure your fuel canister has impacts how well your stove will perform. Afterall, that pressure provides the fuel necessary for a reliable robust flame. When the gas flow is too low (like at colder temperatures or when your fuel canister is almost empty), it’ll take longer to boil water. Luckily for us, regulator technology can help. Adventures in Stoving describes the regulator technology in detail: “A non-regulator valved stove operated at 15% of maximum pressure will have a flame that is about 15% of maximum.” Well, that makes sense. When there’s not a lot of pressurized fuel feeding your flame, you shouldn’t expect a robust fire. Wait--what?! Is your mind blown? With a regulator, if there’s not a lot of pressure, it can still operate at near 100% of flame. As Adventures in Stoving explains, his numbers aren’t exact for any given model of stove. But it gives you an idea of the crazy extent with which a regulator can improve your cooking experience in cooler temperatures. This is why we only seriously considered backpacking stoves with regulators: the best stove for most backpackers and campers is one that will serve them well in a number of conditions, including cooler temps when hot food is the most valued. Practicing good cold weather practices for your stove and your entire backpacking system will keep a big smile on your face. Photo courtesy Duncan Cheung. Nonetheless, Adventures in Stoving advises practicing good cold weather stove habits, which can increase the chances that your backpacking stove will perform as you want it to in cooler weather. The most important suggestion is that if it’s getting to be in the 20s or 30s, warm up your canister stove in your sleeping bag before breakfast (and maybe before dinner) and always use high-quality gas with as little butane as possible (most canisters include butane, isobutane, and propane). We think complicated stoves can be a barrier to entry (or at least a minor frustration) for people getting into backpacking. For all but advanced users, a tricky stove can be a barrier to eating. While it may seem that backpacking stoves are straight forward (screw on the stove and light, right? ), in our experience, many ultralight camp stoves aren’t as intuitive as professional reviewers claim. Some stoves require assembling parts, like one of our favorites, the Soto Windmaster. Or they may have a sticky or complicated unfolding system. Or they may not be stable, especially to those still getting their heads and hands around lighting a butane fuel stove. All these factors can be intimidating or cumbersome for new users. The Jetboil MiniMo is so easy to use, it cuts down the barrier of entry for many hikers. Photo by Liz Thomas. Sure, after you’ve owned the backpacking cooking stove for a while and/or played with a bunch of stoves, these processes become habit and more intuitive. We think that’s one reason why many professional reviewers recommend much more origami-style stoves. But in our experience, for folks buying their first backpacking stove, the assembly processes can be frustrating. While stove-origami is a cool party trick, we think it’s more important for newer backpackers to spend their time perfecting essential outdoor skills like navigation. We think that professional reviewers tend to underestimate how annoying and frustrating it can be to learn how to use a backpacking stove. When folks are learning how to backpack, they’ve already got hundreds of new skills to learn and gear setting-up processes to memorize. We don’t think a using a stove needs to be included in this barrier of entry and information. Complicated gear systems keep too many folks from getting outdoors. There are stoves available that are as simple as an on/off switch. We think that’s the best choice for most people. A stove shouldn’t be a barrier to entry. Even advanced backpackers can appreciate a stove that is easy to use. When an athlete is pushing themselves, eating dinner is essential for recovery. But I’ve seen too many backpackers hike into camp too tried to operate a stove. Regardless of your skill level, the easier your stove system is, the more likely you can muster the energy to cook and eat dinner. Should you get a pot? Mug? Soup pot? There are many kinds of pots. Treeline Review co-founder Naomi Hudetz shows off two cookpots on a backpacking trip of the Boundary Trail in eastern Washington. Photo by Liz Thomas. If you chose an integrated stove (the Jetboil Flash, Jetboil MiniMo, or MSR Windburner), skip this section. Material: Titanium pots are lighter and slightly more durable, but aluminum pots are less expensive. Anodized aluminum pots--like you may have in your home but fit on a camping stove--are best if you’re cooking up something more complicated than boiling water. They stick less and are easier to clean. If you care about weight more than simmering or sauteing, a titanium pot is a good bet (but they can “spot” where the flame hits the metal, so if you like your gear to look squeaky clean, go with aluminum). A short squat pot is more fuel efficient and less tippy than a mug-shaped pot. For solo travelers (or at least solo cookers), 750 mL to 1000 mL is the ideal size. Many people like the MSR Titan Kettle at 850 mL, which the company advertises as working as a pot, mug, or bowl (though we’d argue pretty much anything that shape does). But what makes the Titan Kettle nicer than many pots of similar dimensions is a tight lid and mini-spout that lets you pour water like...well, kettle. Groups of two may be ok with a 1 L to 1.3 L pot or more. Larger groups may prefer a big 2L cookpot or to split into cooking groups of two. Three different cookpots on three different stoves. Stove testing in northern Idaho in winter. Photo by Liz Thomas. Your stove is there to serve you, make you happy, and make it easier and more fun to enjoy the outdoors. Photo by Naomi Hudetz. Read our Full Guide on the Best Backpacking Stoves for details on which stoves we recommend and why.